The Cadets CyberFirst programme, delivered by Ministry of Defence cadet organisations and the GCHQ National Cyber Security Centre, will equip over 2,000 cadets a year with the skills and expertise to become future leaders in this emerging industry. Over £1 million will be invested in the programme each year, giving cadets the opportunity to learn how to protect systems connected to the internet from cyber attacks. Cadets will be able to choose from introductory courses covering the tools, knowledge and skills to protect small networks, to more advanced courses where they will be fully immersed in cyber security issues. The new initiative comes as the Defence Secretary also reveals plans to increase the number of cadets in school units to 60,000 by 2024 and celebrate their achievements through a National Cadet Week. 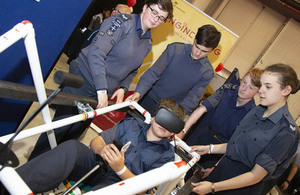 The annual week will give communities and families, along with local dignitaries and MPs, the chance to celebrate the great work cadets and their volunteer adult instructors do across the UK. "We live in a modern world where our phones are rarely out of our hands and we rely on computers to make daily tasks easier. Cyber threats to the UK are constantly evolving and this exciting initiative to train and develop ‘cyber cadets’ – the first of its kind in a NATO state - reaffirms our leading role in tackling security threats head on. "It is important to recognise the vital role cadets play in our communities, and I am determined to grow the number of young people signing up and make sure their successes are properly recognised each year." The UK faces a real and growing cyber threat and it is important we have the right skills to combat the constantly evolving risk. In its first year, the National Cyber Security Centre received over 1,100 cyber incident reports. The new cadet training programme will build on GCHQ’s CyberFirst initiative, which aims to teach young people the fundamentals of cyber security. It will also offer a ‘train the trainer’ course, which will teach more than 50 Cadet Force Adult Volunteers so they can deliver this exciting cadet training programme in the future. The Defence Secretary’s commitment to cadets will also be revealed through ambitious plans to increase the number of cadets in schools from 43,000 to 60,000, giving even more young people the opportunity to learn new skills by joining a cadet unit. Considerable progress is already underway thanks to the Cadet Expansion Programme (CEP), the Government funded scheme that aims to have a total of 500 cadet units running in the UK by 2020. Earlier this week, the Defence Secretary visited Aston University Engineering Academy, a state school with the RAF Cadet Force, where he announced the approval of 30 new cadet units across schools in the UK. Being part of a cadet unit is proven to bring significant benefits to young people, with a recent University of Northampton report demonstrating a positive impact on young people’s self-belief and their attitude towards school. Specifically, it found that joining a cadet force improved a young person’s resilience, teamwork and communication skills as well as increasing social mobility.